It was so fun to see this in the Salt Lake Tribune. Margarete (Maggie) Hicken, at 104, has a sharper memory than most of our middle-aged friends! She is a delightful lady with a positive attitude, and it was an honor for us to work with her on her book. 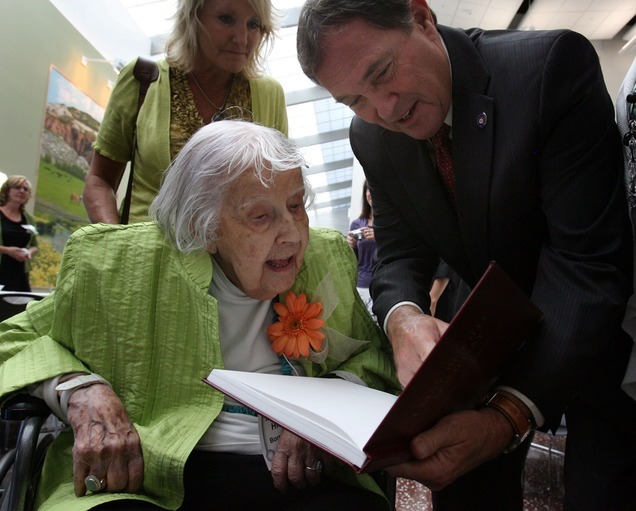 "I May Be Old...Someday" was such a hit with her friends and family (and apparently, Governor Herbert) that it's now in a second printing. "It's not so easy to be famous," she says with a wink. You can see some pages from the book on our "Samples" page.